With a camera this fast, who needs people to screw things up? Casio's new 60 frames-per-second EX-F1 super camera may have some impressive numbers backing it up but what we didn't expect was a claim from the Japanese company that it might be the first step towards doing away with shutter buttons on digital cameras. 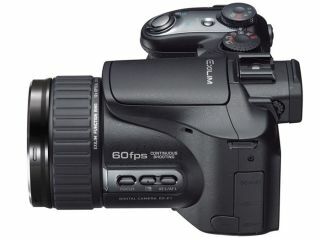 The machine, which can shoot 60 six-megapixel still snaps in a second as well as a startling 1,200 frames of video in the same time, is so advanced a manual shutter may even be a hindrance because it introduces camera shake. Casio executive Jin Nakayama says the high frame rate means it's no longer necessary for a mere human to try to time the shutter release perfectly when five dozen photos are being snapped every second. Speaking to Japanese website Tech On, he explained: "A shutter button might even be one of the principal causes of bad pictures. If users did not release a shutter, there [would be] no camera shake. If a camera decided the timing, it would not miss a decisive moment." "What [is] the third-generation digital camera like? You often say [that] scenes suited for movies should be recorded as movies, [but] when it is difficult to take a picture of an object, take a movie of it. The wall between movies and still pictures is formed by immature technologies." As for the high price for what is still a non-SLR camera, Nakayama admitted that Casio needs to sell 10,000 F1s a month to be able to afford to continue research on the high-speed sensors it uses. Should that happen, he suggested that we could see those spectacular frame rates in something a little more affordable before too long - we can't wait.